"Lobster, melted garlic butter, and shredded unsweetened coconut are this recipe's tasty ingredients. Our home in the Bahamas is called the Lion's Den and that is where this recipe was born. Hubby & I live on a small out-island in the Bahamas and it can be difficult to get gluten free items unless I bring them from the States. I have learned to make the things that I crave out of the ingredients I have on hand. Serve with your favorite dipping sauces or ketchup." Heat oil in a large pot or deep fryer to 365 degrees F (185 degrees C). Combine gluten free pancake mix, onions, celery, coconut, gluten free crackers, lobster meat, seafood seasoning, baking powder, salt, and ground black pepper in a bowl. Combine eggs, evaporated milk, and butter in a separate bowl. Stir egg mixture into dry mixture to form a batter. Drop batter by rounded tablespoons into hot oil and fry until golden brown, about 3 minutes. Remove and drain fritters on a rack. 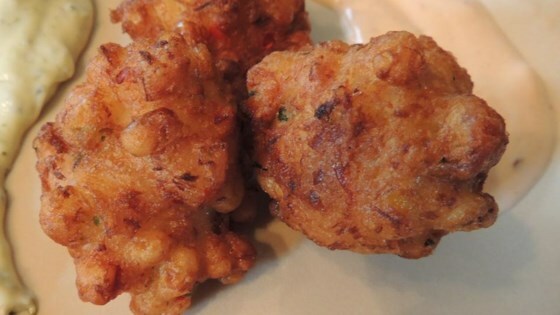 See how to make crunchy, old-fashioned corn fritters. This makes a big batch. Lobster meat can be replaced with any seafood successfully. I mix together Hellman's Mayo, Sweet Baby Ray's BBQ sauce, and Heinz Ketchup to taste to serve alongside. My hubby is the pickiest eater I know, and he said these were amazing. I don't disagree. These were sooo good! I used imitation crab instead of the lobster. I can only imagine what they would taste like with lobster. Wonderful. Thank you so much for the gluten free recipe. Instead of going thru trouble of cooking & chopping up a lobster tail, I substituted a can of pink crabmeat. Every guest raved about this hors d'oeuvre. The receipe is a definite keeper!! !